It may not have been pretty. It may not have unfolded according to script. But Saturday night’s 4-3 victory over Colorado not only extended the Flyers’ home win streak to five, it also gave them a pair of ever so crucial points. An Avalanche survival guide would’ve been nice. But as it turns out, they ended up writing one on their own. The Flyers entered Saturday’s matchup scoreless on the power play in their last five games. Colorado’s penalty killing unit, on the other hand, had given up only one power play goal in their last eight. Certainly not the matchup Craig Berube’s team wanted to see in regard to getting back on track, right? Wrong. Thanks to a five minute boarding major charged to Nathan MacKinnon on Luke Schenn, the Flyers not only re-located their power play scoring, they did so with the guy who last scored a goal on Oct. 18th. Claude Giroux sniped a rocket with only three seconds remaining in the opening period thanks to a terrific screen set by his new linemate, Wayne Simmonds. Giroux beat Colorado goalie Reto Berra over his left shoulder, and also extended Jakub Voracek’s point streak to eight games. The swing in momentum didn’t end with Giroux’s first of the night. With MacKinnon charged for the boarding major, the Flyers still had over three minutes of power play time left to start the second period. “We did a lot of good things, kind of got that big lead, and sat back, and [we] need to find a way to keep pushing and play the same way,” said Giroux. The big lead Giroux spoke of was built on a pair of power play goals scored by Simmonds and Brayden Schenn, with Giroux’s second goal of the night sandwiched between. The Flyers captain added an assist to his nightly totals, feeding Simmonds’ goal early in the second. And that Voracek guy? Let’s just say he’ll get his name in the newspaper. In addition to contributions from the kids who sit at the cool lunch table, the Flyers received outstanding defensive efforts from Michael Del Zotto and Nicklas Grossmann. Del Zotto, who had an assist retracted from him, still finished the night with four hits and a pair of shots and blocked shots. The 24-year-old was leaned heavily on once again, logging 21:25 of ice time, which was second among Flyers defensemen only to Mark Streit’s 23:14. Flyers stifle a 4-on-2 with a nice Grossmann block to the wall. This defense has looked…. passable the past ~6 games. Grossmann, on other hand, played sound defensively for the most part all night. The veteran defender stymied Matt Duchene on one potential scoring chance, that would most definitely have been juicy had Grossmann not stepped in. But it wasn’t until seconds were dwindling down that Grossmann cemented his mention. Protecting a one-goal lead – yes, the Flyers nearly blew a four-goal lead – the Avs nearly punched in the equalizer. Skating with a six-on-five advantage, the Avs hounded the net, striking feverishly at the puck. What appeared to be the break Colorado had struggled for, slipping the puck past Steve Mason, turned out to be nothing more than a tease. Grossmann was able to position himself near Mason’s left side, and shield the net with his skate. Call it lucky. Call it skill. The positional awareness preserved the game, and two crucial points for the orange and black. If the breakdown of Grossmann’s heroics didn’t give it away, the Flyers went from a win via cruise control, to fighting for their victorious lives in the span of a single period. The turn of events seemed swift, mainly because it was. The Flyers went from enjoying six power play opportunities – one being the major penalty to MacKinnon, and another on a five-on-three advantage – and celebrating goals, to scrambling for a regulation win starting in the game’s final period. Third period goals from Max Talbot, Alex Tanguay, and Zach Redmond left the Flyers shell-shocked and in need of regrouping. Berube wisely used his timeout with under three minutes to play, giving his troops a much needed rest coming off of a six-on-four penalty kill. It was Braydon Coburn’s second penalty of the period the Flyers were coming off of, with his first resulting in Redmond’s power play goal at the 11:38 mark of the period. Coburn, who saw 20:18 of ice time in his first game back since suffering a lower-body injury in the season opener against Boston, finished the night with a shot, two hits, and a minus-two rating. The pair of Coburn minor penalties, along with Roy pulling Berra with over three minutes in regulation, led to Colorado dwarfing Philadelphia’s third period shot totals by a margin of 21-6. And being is how the Avs finished the tilt outshooting the Flyers 39-27, it’s easy to point to MacKinnon’s major penalty in the first period as the driving force behind Saturday’s win. Add in the loss of Luke Schenn, who did not return after going down into the board in the first period, and suddenly the victory feels a bit tainted. And while the Flyers do have Carlo Colaiacovo, who was a scratch for Saturday’s game, the potential loss of Luke Schenn would add to a surplus of defensemen who have either found themselves on, or are currently already on the shelf. If Schenn has to miss any extended time, he would be the fourth Flyers defenseman to sustain a significant injury this season. Braydon Coburn returned to the lineup Saturday for the first time since the sustaining a lower-body injury in the season opener, and Andrew MacDonald has been out since sustaining a lower-body injury Oct. 22 against the Pittsburgh Penguins. Top defenseman Kimmo Timonen has been out all season since being diagnosed with blood clots in August. Of course Gostisbehere’s name found the list. Par for the course, right? Watching Zac Rinaldo bait Colorado’s Cody McLeod into a roughing penalty in the second period was not only surprisingly brilliant, it was different than what we’ve become accustomed to with Rinaldo. When Colorado head coach Patrick Roy noticed Rinaldo and McLeod exchanging pleasantries on a previous shift, the animated bench jockey sent McLeod out specifically for Rinaldo during his next shift. And after McLeod unnecessarily crashed into Rinaldo, drawing the roughing minor, the 210 pound forward did all he could to drag Rinaldo to the box with him after play had ceased. The image above shows just how successful McLeod was in his efforts. I LOVE this Zac Rinaldo!!! Bait em into the penalty!!!!! Steve Mason has gone from one end of the spectrum to the other. After sluggishly starting the season with an 0-4-1 record, the former Blue Jackets netminder has reeled off three straight win in as many games. And much to the chagrin of Columbus fans, their current eight-game losing streak started with Sergei Bobrovsky between the pipes for the first two of those losses. Bobrovsky has since been out with a broken finger. His return is still unknown, although they’re making a big deal out of him “skating” on his own in Columbus. On the surface, the career numbers for Claude Giroux and Wayne Simmonds against Colorado may not jump off the paper. But after Saturday’s win, both skaters extended their goal streak versus the Avs to three games each. Giroux now has five points in five games against the Avalanche, with all five of those points scored in the last three meetings. Simmonds has eight points in 16 games against Colorado. 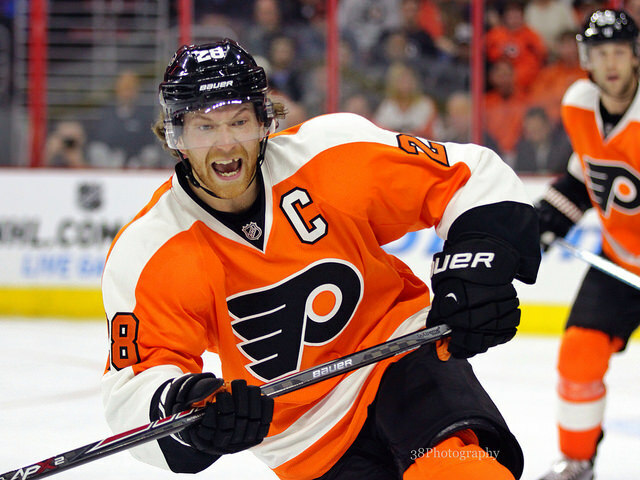 And like Giroux, five of his eight points have come in the last three games. Simmonds (7) from Giroux, Voracek. Get used to hearing that. Patrick Roy led his team into the Wells Fargo Center on Saturday with a reputation of being aggressive,both in strategy and stature. After Nathan MacKinnon was whistled for a five minute boarding major, Roy took exception. Below is a breakdown of his reaction. And despite not giving in after the game, he appeared to have lowered his blood pressure. “I had no problem with the call. My only problem with it is the referee was very close to the play and it was the linesman that was at our own blue line that made the call. I just thought he was too far to make that call,” said Roy. With so many ex-Flyers skating throughout the league, Philadelphia fans are often subjected to the reminders of their former players finding the back of the net. Perhaps this ribbing reached an all-time high last night, when Bridgeport Sound Tigers forward – and former Flyers forward – Harry Zolnierczyk lit the lamp not once, but twice, in Bridgeport’s 7-2 win over the Albany Devils. THW’s Dan Rice was there to confirm, as he provided the image below. The Flyers will have nearly a week to rest on their laurels and tell each other how great they are before welcoming the 4-9-1 Columbus Blue Jackets on Friday. Columbus’ nine points are just one more than Buffalo’s league-worst eight points. The Jackets have been blitzed by the injury bug, gutting a fraction of their core. Both Brandon Dubinsky and Sergei Bobrovsky are back to skating on their own, but with no true time table on their return, things could get worse for Columbus before they get better. The big news, of course will be the return of Scott Hartnell. And while the R.J. Umberger complaints grow louder, Hartnell will bring a two-game goal streak in which he’s scored four goals. The Flyers might want to take advantage of Todd Richards’ depleted resources. But even with the shorthanded team, beating the Blue Jackets on Friday won’t be as easy as purchasing Geico insurance. Columbus owns a three-game win streak over Philadelphia, and are led by a healthy Ryan Johansen (six goals, 10 assists).